It's a glorious day in Venice, California! I was on my morning beach/Friday Farmer's Market stroll, and while waiting for the light at Windward and Pacific, I heard two tourist girls talking, and all they could say was "What a day!" back and forth. They were right. It doesn't get a whole lot more fantastic then the great outdoors today. Jasmine is in bloom, the air smells like the best perfume ever (with a distant aroma of breakfast bacon for good measure), the skies are electric blue, and the sun is shining bright. The surf looked great, and everyone was all smiles down at the beach. Magic. 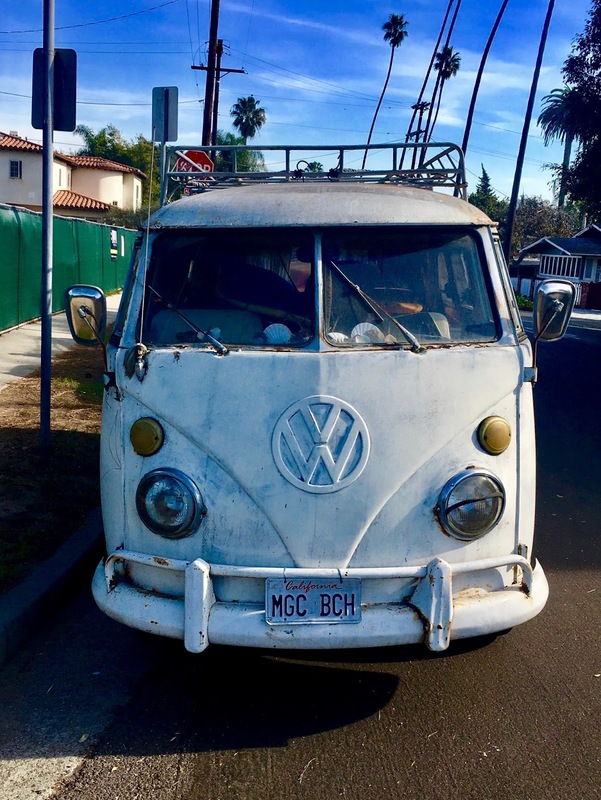 On my way back, I passed this ancient VW bus, and noticed the custom plates ... MGC BCH. Magic Beach! The other day I saw someone write that sometimes you love a place almost like a person, and that is this magical Venice for me. Actually, I love it MORE than a lot of people these days. Thank you, Venice, for all that you have been, are, and will continue to be if we have anything to say about it. And we do. Happy Friday! Happy Weekend! Please join us all for an entirely magical day of revelry for the annual Venice Mardi Gras parade! Dress up fun, and meet up at noon30ish (Venice standard time) on Rose and Ocean Front Walk. Let the good times roll on our magic beach!